I love Hemp Rose Pure Castile Liquid Soap by Dr.Bronner's Magic Soaps especially on my face!! Great scent and does a good job of cleaning clothes my hair and skin. Love Dr. Bronners products! 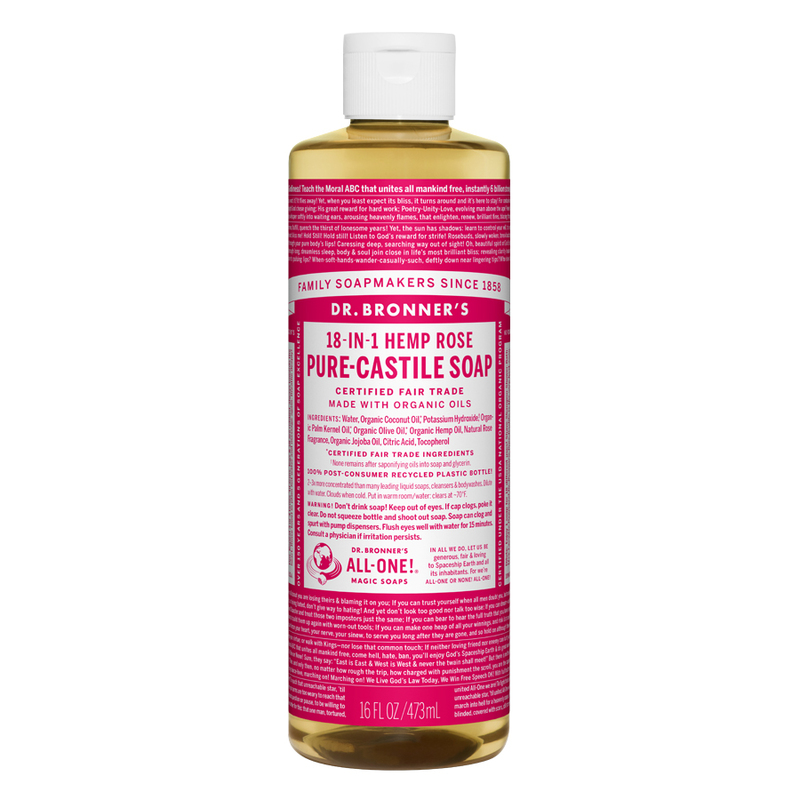 Rose Pure Castile Soap Liquid by Dr. Bronner's Magic Soaps is safe for the skin and works well for washing clothes & for washing floors. One need use only a small amount. Water‚ Organic Coconut Oil*‚ Potassium Hydroxide**‚ Organic Olive Oil*‚ Natural Rose Fragrance‚ Organic Hemp Oil‚ Organic Jojoba Oil‚ Citric Acid‚ Tocopherol. Hemp Rose Pure Castile Liquid Soap by Dr.Bronner's Magic Soaps itself is a good quality one. It lathers well and doesn't dehydrate my skin. I also use it for other purposes like washing dishes and it works well for other household cleaning jobs. Now, the reason this scent in particular gets 4 stars is simply because of it's very sweet smell. I'm not very keen on it, although it is true to its rosey scent. I do adore the peppermint version of this soap. Overall it is a good soap and I recommend it to you. Lathers well. Does not dehydrate skin. Hemp Rose Pure Castile Liquid Soap by Dr. Bronner's Magic Soaps is very useful in making DIY home-cleaning products. You dilute it with water, so you end up getting more uses out of the bottle than you may think. This particular soap has a nice scent that isn't overwhelming. Hemp Rose Pure Castile Liquid Soap by Dr. Bronner's Magic Soaps is great, its gentle but yet effective! It smells great, has no detergents, or chemicals. It be used as a body wash, a face wash, or an all purpose cleaner. Its a whole home cleaning product. I recommend this highly. I don't like really strong scents. But Hemp Rose Pure Castile Liquid Soap by Dr. Bronner's Magic Soaps is perfect! It's a distinct rose scent but not overpowering. It's also not too flowery. This soap does not dry out our skin and a little goes a long way. I love the smell. Been using this product for a year. Not overly drying to the skin either. The lovely, delicate fragrance; it's general usefulness.